India is moving from Incandescent and CFL lights to LED lights. Energy efficiency, environment friendliness and low maintenance costs have been a key driver for this change. The government policies and schemes are also leading the entire movement. LED Bulbs consume 1/10th of the power of incandescent lamps and half as much as CFLs to provide the equivalent amount of electricity. 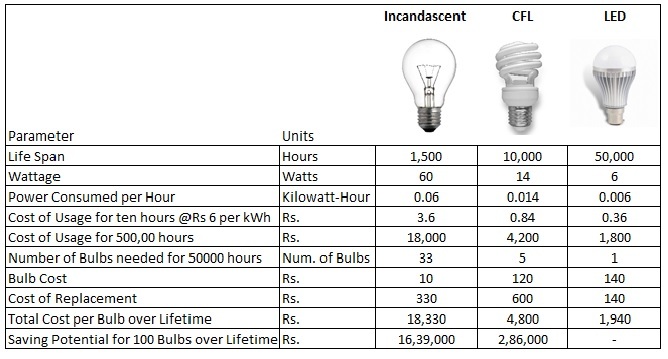 At a cost of Rs 6 per KWh LED Bulb will operationally cost 36 paisa for 10 hours of usage against Rs 3.60 for Incandescent and 84 paisa for CFL. For 50,000 hours of operation, one LED bulb would save over Rs. 16,000 as compared to an Incandescent and Rs. 2,600 over CFL. Scale this by the number of bulbs your facility has and the benefits would be evident. The equivalent used in the calculation here is 6 Watts Led Bulb against 14 Watts CFL and 60 Watts Incandescent which provide nearly the same lamination. LED lights can easily survive 50,000 hours of operation. So if used for 3 to four hours a day, they can run for 25 years without any maintenance or replacement costs. Even by the end of their 50,000th hour of operation, LED lights will continue to produce an estimated 70% luminescence as their maximum rating, thus, it becomes an extremely economical decision for both segments- Customers & Business entities as compared with the incandescent lighting system that needs replacement in every 2,000 hours of use. However, a bad driver and heat sink can drastically reduce the lifetime of an LED bulb. So warranty is an important aspect to be considered when buying an LED bulb. Unlike CFL lights, LED lights do not contain mercury which is harmful to the environment. Also reduced electricity consumption translates to reduction in carbon emission, which is becoming critical for companies and government. For example, the recent replacement of all bulbs in South Block of Indian Parliament with LEDs which will lead to a saving of 7,000 units every month as a result. The quality of light produced by LEDs over traditional incandescent fixtures can improve the ambient illumination of your home or office space. As a matter of fact, the spectrum of traditional lamps shifts its frequency with time, casting unseemly shadows and even unwanted colors. Whereas, LED bulbs spread light wider in the spectrum than their fluorescent counterparts, giving a more even distribution of light and making a facility seem more naturally, aesthetically lit. A key part of assessing its intensity is luminous flux of the LED light source. Lumens is a measure of the brightness of the LED source. More the lumens per watt, the better the LED Bulb is. LED bulbs are available in various color temperatures: Cool Daylight (White) to Warm White (yellow). Choosing the right one based on the mood to be set in the room is important. A lot of government initiatives have been taken to incentivize individuals and businesses to adopt LED lights. In this regard, Delhi is the first city to implement the domestic efficient lighting program called ‘Prakash Path’. Under this program, each registered consumer of power will get two LED bulbs for Rs. 10 (their actual cost varies from Rs. 350 to Rs. 600) and Rs 10 will be added to their electricity bill for the next 12 months. However as mentioned above the savings generated due to lower power consumption of LED lights would end up being more beneficial. Similar to Delhi, Andhra Pradesh government has decided to distribute 72.46 lakh 9W LED bulbs to domestic consumers at Rs.10 per bulb. Another recent breakthrough is the latest development in Indian government, where it will replace all street lights in the country with led bulbs in the next two years. The reason why government is incentivizing LED lights is to bring down the net load of the discoms. This reduction makes more power available with the discoms which can be used for supply in commercial and industrial establishments, thereby, resulting in relatively higher revenue. Also, when there is steep rise in power demand (majorly after day time), it would help in peak power reduction. Hence, discoms would save on power cost which they have to buy from power exchanges during peak hours. To get started on the project of revamping your lighting system with LED lights, IndiaMART provides you a list of suppliers in your area that can help you with your lighting needs. IndiaMART has multiple suppliers to choose from across hundred plus LED light categories like LED Downlights, LED TubeLight, LED Office Light and others. So choose the categories depending on your lighting needs and get in touch with the suppliers to start reaping the benefits of LED technology.